There have only been a handful of times I’ve read a comic, then re-read it, then again, and so on. 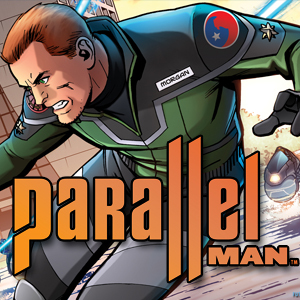 Abnett and Lanning’s run on Nova, Brubaker’s Winter Soldier, and Millar’s Civil War are among the high water marks that do what the debut issue of Parallel Man has done. Let me put it to you this way: it captivates with all the action, charm, and fun of a classic sci-fi film yet it’s also hard sci-fi. Do you want to feel like you’ve seen Star Wars for the first time all over again? Go get this book – it’s out today! 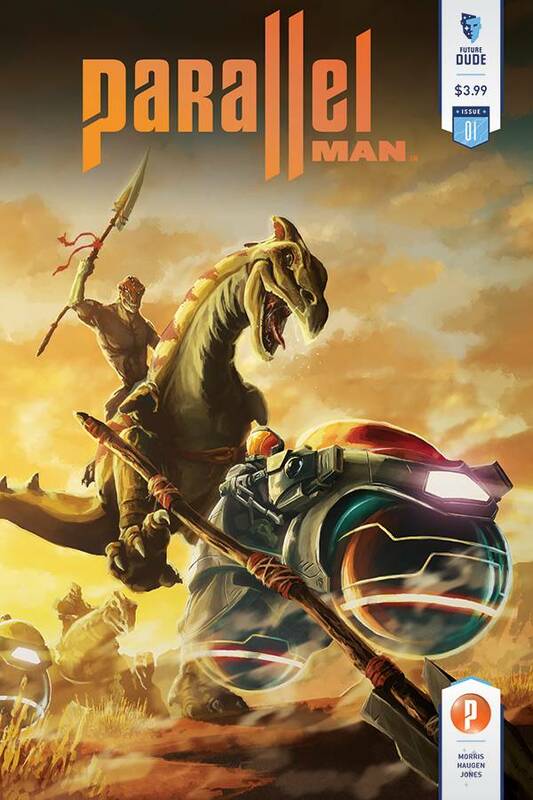 Parallel Man is a 7 issue miniseries from up-and-coming transmedia publisher, Future Dude. It follows Commander Nick Morgan, an intelligence agent from an alternate Earth who has rebelled against his totalitarian government, The Ascendancy. In his world, it was multiversal technology that won World War II, and with that, a different kind of America rose to power – enslaving multiple worlds. The Ascendancy’s sights are now set on our Earth, which they call Beta 76. Morgan’s grandfather was a rebel, a “Futurist”, and from him he learned about the other Americas and the freedom they had. The book opens with Morgan’s first act of insurgency: finding a mysterious device planted on our Earth by his grandfather. He’s quickly set upon by the Hellfighters Squad, an Ascendancy team on trans-dimensional hoverbikes, and the series immediately kicks into overdrive as they give chase across several vastly different alternate Earths. Parallel Man is the brainchild of Future Dude founder, Jeffery Morris and Frederick Haugen along with artist Christopher Jones. If you recognize Jones’ art, it might be that you’re a Young Justice fan. He drew the bulk of the comic tie-in to the amazing DC Nation show and with Parallel Man commands some stunning visuals. The designs of the tech and characters are sleek, clever, and very grounded in its futuristic look. The vehicle Morgan pilots through the first issue has the distinct flavor of something you could see on the road or skies in the near future. What’s most impressive is how unique, yet familiar, the series feels. The first issue is a fast-paced chase, remarkably well-balanced against developing plot points and hints at characterization to come. Before we even meet Nick Morgan, the book’s primary character is President Obama who’s abducted along with Air Force One for a business meeting with the leader of The Ascendancy. It’s an ominous scene as the President of OUR Earth flies over a massacred alternate Washington, to receive The Ascendancy’s message. Adding to the familiar feel is another figure from our own timeline: Carl Sagan! Yes, alternate earth Carl Sagan is the leader of the Futurists – the scientist rebellion determined to end Ascendancy’s rule and continued annexation of the multiverse. It’s unique to have an alternate Earth book so well-grounded in our own reality – it keeps the drama up and the steaks high even amidst the free-wheeling sci-fi of worlds populated by fungus, dinosaur people, or a hyper-industrial Chinese metropolis. My only gripe about Parallel Man is that I want more. In this first issue we meet Warren Cartwright – leader of The Ascendancy, Major Mackenzie Cartwright – leader of the Hellfighters, our hero – the newly AWOL Commander Nick Morgan, and Nick’s slacker, neckbeard self from our own reality. That’s a lot of major players for one issue, and there’s not nearly enough time spent with any of them. I also hope that we get to spend more time in the alternate Earths, rather than zipping through them (as cool as it was). But it’s all good – this is only issue one! We’re no doubt going to get all the character building and backstory I’m craving in future issues. The short version: Parallel Man is a ridiculously fun, truly great sci-fi comic. Issue one is out today at stores and online and issue two hits November 12th. If you can’t find it in your local shop, demand they order it! 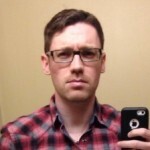 Nerdy Show :: 2012 Final Boss – Top 20 Nerdy Things Year-End List!